Allie Weill was named an AAAS Mass Media Fellow! She'll spend this summer embedded with KQED in San Francisco doing science journalism. We're excited that Paige Kouba will be joining us -- and the North Lab -- as a PhD student in the Ecology program in September. She's now a Harvard Teaching Fellow and an Assistant Coach of the Harvard XC/Track Team, competes professionally for Saucony, and will soon be moving west! Allie is again leading the Kids into Discovering Science (KiDS) program at Lower Lake Elementary school, which included classroom teaching about ecology and evolution, a hands-on experiment, and a field trip to McLaughlin UC Natural Reserve. We thank the Pitzer Foundation for their continued support of this program. Mike Koontz has developed methods to reliably use drone photogrammetry to build multispectral 3-D models of forest structure, and is using this to map forest structure around bark beetle outbreak sites in the Sierras. Brian's paper on shifting treelines in the Great Basin, "Leapfrog in slow motion," was published in Global Change Biology. Some press coverage here. Susan Harrison, Marina and Andrew published a paper (Climate-driven diversity change in annual grasslands: Drought plus deluge does not equal normal) in Global Change Biology synthesizing our experimental and observational drought response studies to show that seedling mortality during winter drought is a likely cause of the decline of some wildflowers in California grasslands. Andrew was named Faculty Director of the UC Davis Natural Reserve System, so he gets to work with our great reserves staff and the John Muir Institute for the next 5 years to further strengthen the system. Key goals include: 1) Building up the system's capacity to serve as California's natural observatory system and support climate change mitigation and adaptation research; 2) Strengthening outreach to under-represented groups and bringing more teachers and students in to experience scientific exploration at our reserves. 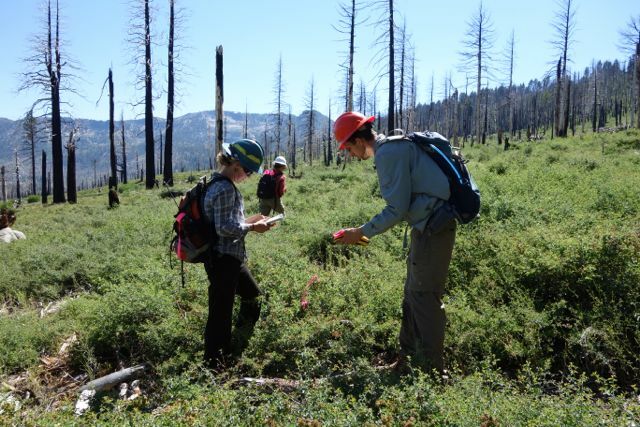 The Joint Fire Science Program funded Derek's and Andrew's proposal with Kevin Welch on optimizing tree planting treatments in severely burned forest patches in the Sierra Nevada. We're now working withsilviculturalists and ecologists in California’s national forests to design the sampling. 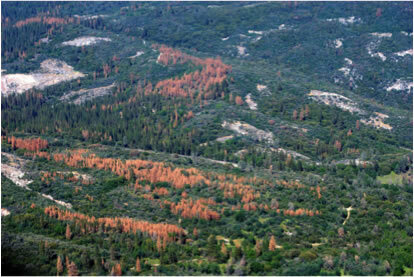 We study how plant populations and communities respond to change, including sudden, major disturbance such as fire and drought, as well as more gradual changes in climate. At the shortest time scales, we are focusing on how communities and populations respond to drought and fire, and how invasive species respond to novel habitats. Over longer time scales, we examine local adaptation to gradients in climatic conditions and to variability in those conditions. 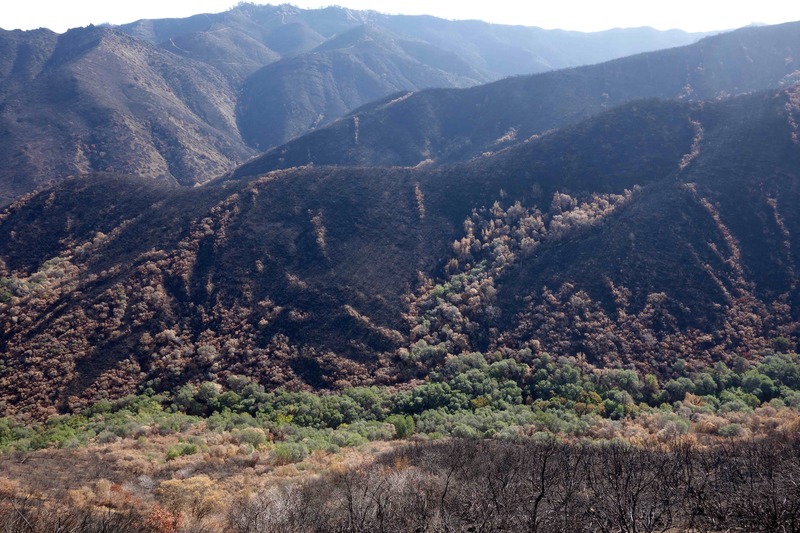 Much of our work involves fire, since this plays such a major role in the ecology and evolution of Mediterranean climate floras and in local land management here in California. Our research on the interactions among fire, vegetation, and climate has direct application to forest and rangeland management in an era of climate and land use change.